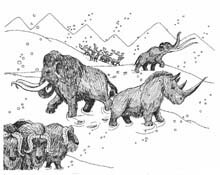 The Quaternary Period began with an ice age about 1.8 million years ago. It is often called the Age of Humans. Each epoch has unique characteristics for climate and geography, so the plants and animals that lived during those times are unique to each epoch, too. In the early 1800’s a system for naming geologic time periods was devised using four periods of geologic time. They were named using Latin root words. In Latin, quatr means four. Early geologists chose the name Quaternary for the fourth period in this system. We no longer use this system of dividing geologic time, but the name, Quaternary, is still commonly used for the most recent period in geologic time. The system for naming the periods is constantly changing. As more information is collected, analyzed, and debated, the divisions created for looking at geologic time changes. There have been recent changes to the way scientists look at this time. There was talk of dropping the old name for a new one called the Neogene Period. The old name had many defenders and there was debate about changing the name. Eventually the matter was settled and the old name kept its place. Continents Arrive at Present PositionsDuring the quaternary period the positions of the continents were much the same as they are today. What has changed during this time is the climate. The Pleistocene Epoch began with polar ice sheets far bigger than they are now. 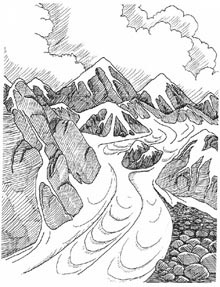 At times, the glacial ice reached far down into parts of North America, Europe, and Asia. This is commonly referred to as an Ice Age. Generally temperatures were cooler everywhere on earth during this time. But the climate of the Pleistocene did not stay the same throughout the entire Pleistocene. The polar ice advanced and retreated. The earth warmed and cooled. Scientists have cataloged over 60 cycles of glacial expansion and contraction during the Pleistocene. Still In The Ice Age? There is a reason the polar ice advances and retreats. It isn’t random. The variations are because of changes in the Earth's orbit. These are called Milankovitch cycles. The last major glacial advance was about 18,000 years ago. Some scientists say that we are still in an ice age and the current warming trend is just an interglacial period or temporary retreat of the polar ice. When the polar ice advances, huge amounts of water become locked up in the ice. This causes sea levels to drop. Land once covered by water is left high and dry. During a time of advancing glaciers, the Bering land bridge revealed itself between Alaska and Siberia. This happened many times during the Quaternary Period. 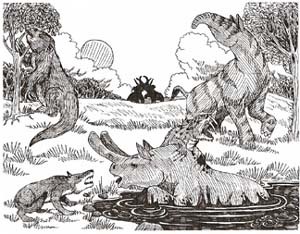 Even though many of the plants and animals of the Quaternary Period are virtually the same as those living today, there are some important differences. First, there were certain animals that were well-adapted to the cold climate of the early Pleistocene Epoch. The wooly mammoth, mastodon, wooly rhinoceros, reindeer, and musk ox all developed thick fur to help them survive the frigid temperatures. Most of these animals became extinct when climates warmed in the Holocene Epoch. No one knows why. But as with all mysteries lots of theories have been put forth. One popular theory says that humans hunted them to extinction. Another says that these animals could not adapt to the warmer climate. The only thing that is for sure is that these huge beasts no longer walk the earth! The Pleistocene is known for its megafauna or “giant mammals.” Along with the wooly mammoth and wooly rhinoceros there were other giants: bison, ground sloths, and deer. There were giant carnivores as well. The saber tooth tiger, cave bear, and dire wolf were bigger than their modern counterparts. The megafauna disappeared at the end of the Pleistocene. All that remains are a few species of smaller, though still good-sized, animals in Africa: the elephant, hippopotamus, and rhinoceros. For us, the most important development of the Quaternary Period is the development of the hominids: Humans. From the first primates in the Tertiary Period to modern man, the hominid species has evolved amazing abilities. The earliest hominid fossils found so far date from the late Tertiary Period. They were found in Africa. As the Pleistocene Epoch continued, hominids spread throughout the world. Their larger brains allowed a level of thought and feeling that was, and is, unique among the animals. We think and solve. We change and control. The future of our planet will be greatly affected by the Age of Humans.